JAM IT (Throwback Games) is a superb release that we're really proud to have been involved with, and after spending the extra time and expense in upgrading the manuals, stickers and cart labels to professionally designed/printed standard I was reluctant to then merely snap messy shots of the game and extras with my phone. So, after debating the pros and cons for some time, I finally bit the bullet and tracked down a local product photographer here in Exeter, and what you see here are the results (click images to expand). Obviously, I don't regret this decision at all! :) However, the problem is now that whilst the in-store presentation of JAM IT is superb, I now need to consider upgrading our back catalogue to match. So expect some updates to our more popular older games throughout 2017 (as well as this standard going forward with new releases)... Anyway, we're missing the important news here; information about the actual game cartridge! 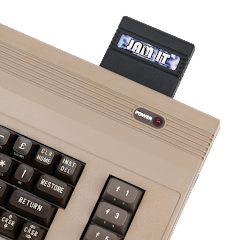 Developed by Leigh White of Throwback Games, JAM IT is an arcade style 2-on-2 basketball game for the Commodore 64, featuring the most intense sports action and entertainment ever crammed into 64K! Do you get confused by complex button combinations in modern basketball video games? In JAM IT, just one button with your control stick is enough to make extreme dunks, jump-shots, blocks, passes, post-up plays, and steals! 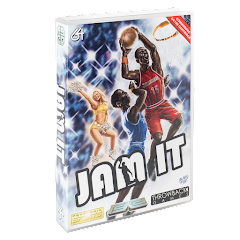 JAM IT supports 1-4 simultaneous players (via the Protovision 4-player adapter) and features opponents with realistic and challenging AI, 4 difficulty levels, 3 unlockable bonuses, in-game on-screen commentary, comprehensive statistics and even a halftime show mini-game! 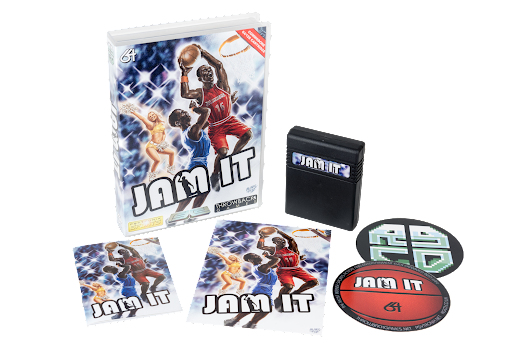 JAM IT is presented in a modified plastic Universal Game Case complete with custom made foam insert (as with the rest of our deluxe range). The cover art was illustrated by the legendary Oliver Frey and the game comes complete with a professionally printed 16-page manual, large weather-proof vinyl RGCD and JAM IT stickers, a post-card and a 170gsm matt-coated A3 poster. The 512KB PCB is housed in classic black cartridge shell, with a 3D domed JAM IT label. JAM IT is available from our online store priced at £30 (plus shipping). Please note that Pystronik Software are selling the game on cassette and premium/budget disk over at their Binary Zone Retro Store priced at £5.99/£5.99/£12.99 (plus shipping). The full game is also available to purchase as a download direct from the Throwback Games itch.io page for $2.99 (+VAT).